Avante that appeared in 1988 as the highest models of 4WD buggy. TRF (Tamiya Racing Factory) was formed in the following year, Tamiya has taken the first step to challenge the race in the world. The new design as a racing car based on intake, the Avante the know-how obtained in the race, I adopt a carbon plate that was used in aircraft and F1, you can use up expensive titanium bis large capacity oil shocks and ball differential, lightweight, It is the egress has been developed aiming to win the race. At that time, in the belt drive car prime, egress that was active in the race as a shaft drive cars only, revived by potential up the parts to fit the RC the current scene. 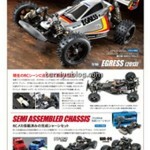 – Shaft-driven 4WD chassis with high rigidity and using lots of carbon parts]　chassis carbon double deck. I am proud of the high rigidity that does not budge even twist. Power train of motor shaft drive 4WD Full ball bearings vertically. Ball diff front and rear new parts reviewing the original design. In addition to the smooth operation, it is up to both maintainability, durability. In addition, the built-in one-way bearing in the drive gear and show the straightforward handling by the torque splitter effect. It is also possible that instead of the one-way bearing, to lock specification. In addition, incorporating the same structure as the TRF series of current, universal shaft to be abused most drive system you’ve got a high reliability and smooth drive. Independent suspension 4-wheel double wishbone. Equipped with four oil damper employing the aluminum cylinder, stabilizer also mounted on the front and back. Front upright is aluminum cutting made ​​of high strength. Equipped with ball bearings to the wiper arm shaft, steering system produces a linear handling with the carbon plate of 2.0mm thickness. Titanium bis does not employ this time, but I realize the performance improvement of about more than make up. In the brushless motor current mainstream, you can enjoy a wonderful run. Secure traction by using the one-way ball differential of the new design, the center back and forth. Aluminum cap high oil damper in double wishbone suspension. Carbon double deck chassis 15mm stretched the wheelbase to Avante, enhanced driving stability. 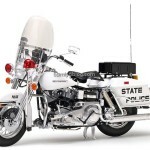 Private type is used as a Detroit police for already in 1908 there is no start-ups, motorcycles Harley-Davidson Inc., equipped with equipment for police use in 1921 further Police first type were made. Electra Glide FLH1200 is one of the top model to represent the Harley’s in the 1970s, but it is equipped with V-twin engine boasts a displacement of 1200cc as its name the “shovel head”. It was what is full of personality that bulk-long total length 2.4m, also weight 300kg or more and imposing like big bike. 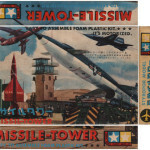 Result of improvements stacked basic form that appeared in 1941 “FL model” since, I show excellent stability up to the high speed from low speed by the engine with a room that has the durability and unrivaled high reliability, easy to handle further. United States, not to mention I was working as a police motorcycle in the world. 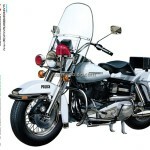 This is a precision plastic model assembly kit reproduced in 1/6 scale motorcycle specifications ★ Harley-Davidson FLH1200. ★ about 400mm total length, about 185mm width. 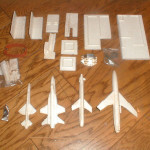 ★ plastic parts are composed of chrome-plated parts and molded white color, such as gray, matte. Beautiful finish can enjoy. ★ metal handle, brake disc, such as muffler protector. Synthetic rubber sheet, such as grip. ★ I reproduce to realize the full equipment of the police specification only saddle and windshield, warning light, such as radio box large. ★ mechanical siren on the left side muffler top also modeled. ★ I’ve prepared a slide mark and meter display and “POLICE” logo fender. ★ I started before and after suspension, you can enjoy such as brake pedal and the side stand of the return spring with, also the operation of each part. 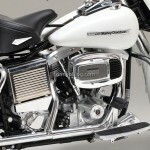 ★ Gotae enough also made ​​air-cooled V-twin engine with the nickname of the shovel head. ★ tire hollow rubber with a texture. Tread pattern, of course, I was reproduced in sculpture to character of the side wall. .
★ Reproduce to realize the full equipment of the police specification only radio box and warning lights, such as saddle bags. 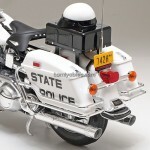 ★ Mechanical siren which is mounted on the rear wheel, helmet that can be used as part of accessories as well. 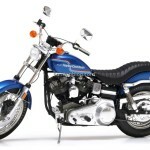 ★ Harley-only, air-cooled V-twin engine finish of precision full of a feeling. Use plated parts to muffler and air cleaner cover. ★ Reproduced without the speaker box and windshield of such large, leaving the police for equipment. 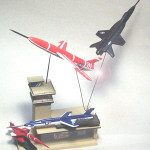 ★ Fire extinguisher is also modeled as an accessory part. 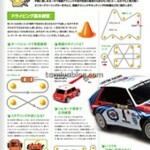 ★ Character and “POLICE” and “STATE”, and meter display is provided by the slide mark. Including Big Machine big machine in was told the 1970s, the King of the motorcycle, the FLH80 classic and FLH1200, Harley-Davidson, has been producing motorcycles of various kinds directly below. Top model of sport type of company was FXE1200 super glide among them. Super Glide production was started from 1971 is equipped with air-cooled 4-stroke OHV · V twin 1207cc engine called FLH1200 in common with the “shovel head”. The frame is also used double cradle the same type as the FLH basically. On the other hand, spoke wire wheels and front fork, and narrow headlights is something which is based on parts of a light XL Sportster. Super Glide that pioneer of the genre of sports touring is produced until 1978, and it was with roots custom style genuine manufacturer of “factory chopper”. FXDB Dyna Sturgis 1991 and FXS Low Rider, of 1977 which attracted worldwide popularity will take over the seat, as the founder of the family on behalf of Harley-current lineup, the pedigree has been handed down. Opened up a new genre of sports ★ touring, the 1975 model Harley-Davidson Super Glide FXE1200, This is a plastic model assembly kit of the 1/6 scale. ★ total length 389mm. 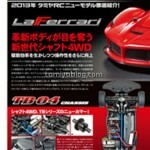 ★ accurately reproduced ranging engine, the wheel from the frame. I can enjoy the assembly in making Gotae. ★ Gotae making plentiful was reproduced precisely as well as carburetor and spark plug including delicate cooling fins “shovel head” OHV · V twin engine. 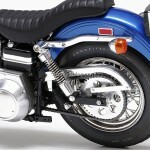 ★ Front and rear suspension is working smoothly equipped with a coil spring. ★ tail light you have beautifully carved the lens cut, turn signal. 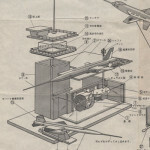 ★ oil tank under the seat is reproduced battery of course. ★ wire spoke wheel tightens plated parts, the feet. ★ The transparent parts and decals, the meter finish of feeling full. ★ side stand collapsible with a return spring. ★ tire hollow rubber Realistic which reproduced the exact tread pattern. 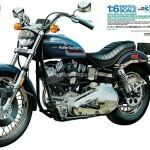 ★ Reproduce to realize fully the slim form of the Super Glide was finished in chopper style. 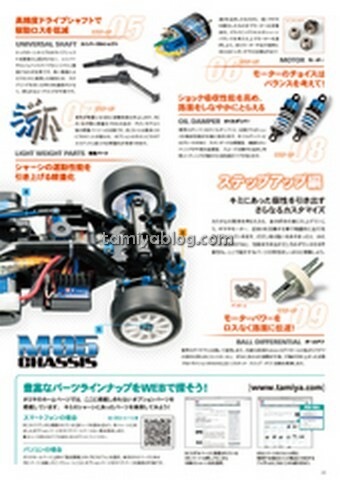 ★ Gloss air cleaner and tappet cover, such as muffler, engine using the plating parts of matte two worth seeing. ★ Turn signal and tail lamp with clear orange and clear red parts tightens the rear view. ★ Texture by a special plastic handle grips and seat, the change lever. 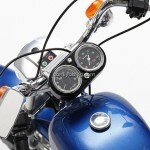 ★ Fuel tank and small, twin-lens meter of speed and tachometer is sporty. ★ Harley logo and rainbow line of S-shaped painted on the fuel tank, such as the instrument panel provided by the slide mark. This entry was posted in Future Releases on October 28, 2013 by admin. This entry was posted in Vintage on October 14, 2013 by admin. 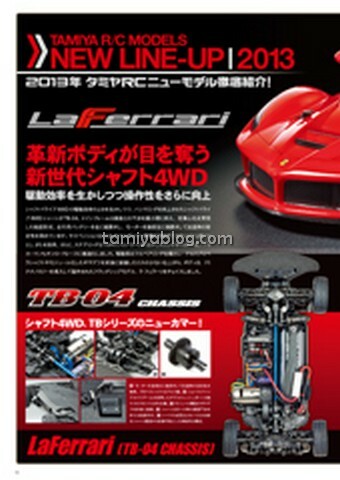 Please note that all information is tentative until officially confirmed from Tamiya, INC. and no responsibility is taken for the correctness of this information. This entry was posted in Future Releases on October 7, 2013 by admin. 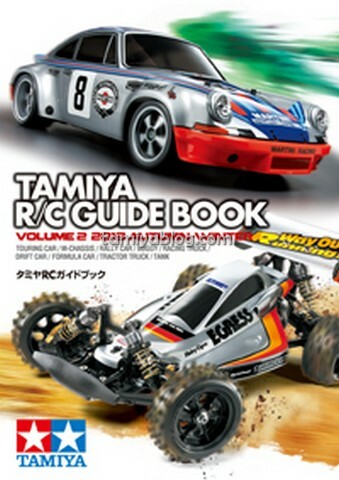 Tamiya RC guidebook Vol.2 the early new products of interest that have been presented at the Hobby Show in September, and posted a 100 units at once carefully selected major RC model Tamiya is issued. 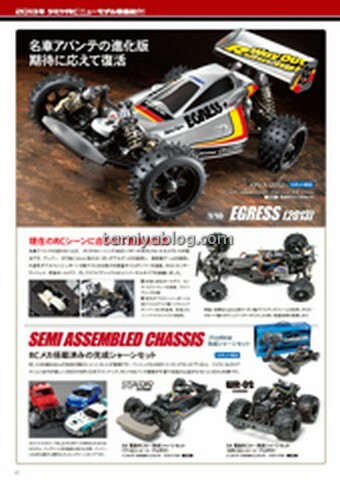 XB of Ready-to enjoy running immediately formula car and touring car, big size of the charm out and tank trailer truck, the box of the force fun Willy model, a high-speed run buggy that does not choose the place running, ran full of action convenient one book, such as, but also to look for one of the favorite to introduce the machine in each genre. 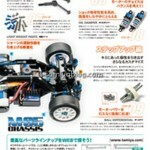 Moreover, print the QR code, you may want to jump to Tamiya home page using a mobile phone or smartphone, to enjoy videos RC. 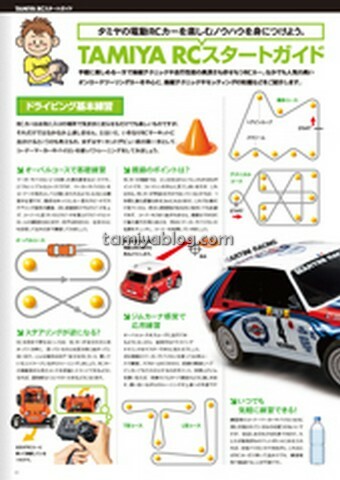 In addition, guarantee the basic guide for the performance and setting up, and basic practice guide of driving, how-to for the fans to start the RC from now on would be helpful. 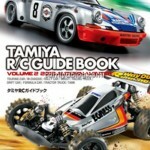 And hobby shops nationwide, RC circuit of Tamiya was also published at the end of the book. A4 size all color, all 38 pages of hearty. This entry was posted in Future Releases on October 2, 2013 by admin.